Do you use Microsoft Office? If you do, you probably know how spectacular it is, especially for your email. You can store the entire email database in just one file, if you use Microsoft Outlook. Plus, this email client is easy to use and has all the features you may need if you work with mail accounts. The files that you store your information in are PST files and you can keep them in any place you like, as well as make copies and it’s still going to be just one file and not a bunch of folders, filled with different files. This simplicity is on one hand very comfortable but on the other hand, it’s much easier to lose or damage just one file that several. If your PST file gets damaged, you won’t be able to open the whole database and if it gets deleted, you’ll delete all of your emails at once. When such things happen, the best decision is to use PST recovery software. You didn’t know it even exists? It does and not just one but many. We are going to tell you about one of the best programs in the field. 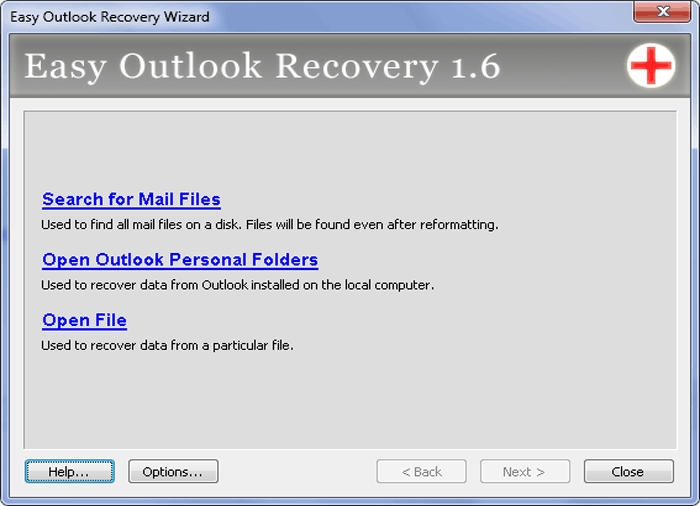 This is Easy Outlook Recovery and it’s specifically developed to meet the needs of an unfortunate Outlook user. Don’t worry, if you happen to delete your PST database, it can be recovered. The great thing is that you can repair a damaged file as well and you won’t be required to even learn how. You won’t need to read any manuals or something of the sort, the only thing necessary is just an utility which is Easy Outlook Recovery, The name tells the truth, it’s indeed very easy. Don’t let it fool you into thinking that the functionality is limited because of its easiness, it’s not. The fully functional program does its job—PST recovery very well, and you can see it for yourself if you want and if you’re having any doubts concerning the program. In order to do that, you’ll only need to obtain a trial version and test it with your own files. If you have deleted a PST file, simply run a scan and it will show all the files that can be recovered. If your PST file is damaged and you have no idea if it can be repaired, upload it into the program with the help of Recovery Wizard and see what can be done. All of the preview features can be accessed in the trial version for free so you can be sure that no one’s going to charge anything for trying. PST recovery is affordable and quite simple and you can make sure of it yourself if you download the program from our web site for free.